Right-click on the document and select the option Transcribe Audio File or Transcribe Video File. The Multimedia Browser is displayed and placed at the top of the screen. The “Document Browser” with the transcript is displayed directly below – where you can write your transcript. A dialog window is displayed to the left of the Multimedia Browser where you can adjust all your settings for the transcription. or use the play and pause icon in the Multimedia Browser”. To quickly navigate to a certain spot in your audio file, use the slide control in the Multimedia Browser window or use the keyboard combination F11 and ⇧+F11 to rewind or forward 5 seconds. Tip: How to use the function keys for transcription on a Mac is described in our Frequently Asked Questions. The transcript and the recording are linked to each other using time stamps. For detailed information on using time stamps, see this section. The transcription text is stored automatically in the project file every 5 minutes. You can change this time interval in the Transcription settings. To access the settings, click the gear icon at the top right of your MAXQDA window. A rewind interval of 2 seconds is set by default so you continue your flow when you resume playback. You can adjust this interval at any time, to a time between 0 and 10 seconds, in the transcription settings. Tip: You can close the Transcription Settings window if you don’t need it. You can open it at any time by clicking on the Transcription Settings icon on the left side of the Multimedia Browser. To adjust the volume and playback speed, click the Control Panel icon in the Multimedia Browser. 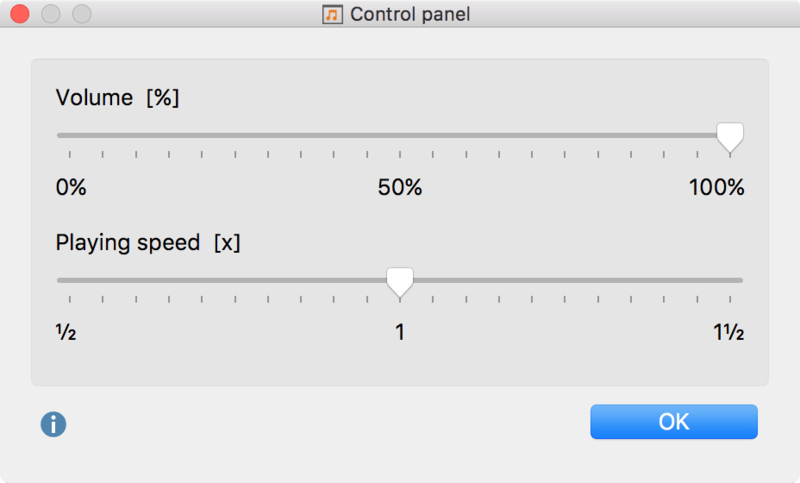 The following dialog window will appear, which allows you to adjust the volume and speed of playback. You can code the typed text with new or existing codes during transcription. To do this, highlight a text segment, for example, and drag it to a code in the “Code System”. The whole functionality of the Multimedia Browser is also available. This makes it possible to highlight and code sections and to set memos and document links. For detailed explanations on how to use the Multimedia Browser, please refer to the section for coding videos. 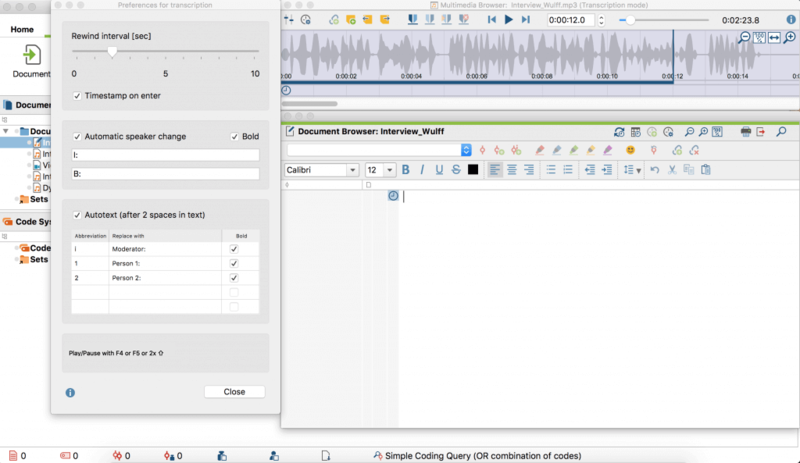 You can start and stop Transcription Mode at any time – just close the Multimedia Browser. To resume working on a transcript, right click on the document and select Transcribe audio file or Transcribe video file. The yellow “Science” switch has the same functionality as the F4 or F5 key (depending on the software setting inside the foot pedal): press once to play, and a second time to stop. The black “Science II” switch must be held down to play media data and will stop playing when released.